On any visit to Bad Shepherd's brewpub in Cheltenham, you won't be short of beers to pick from; even without venturing into the Wolf Of The Willows or guest beers section of the tap list, the in-house offerings are likely to cover hops, fruit, something dark and something high in alcohol. But they decided they wanted to add something at ground level, a true session beer, something for locals for whom the brewpub might be a first brush with the wide world of craft beer. So they came up with Reserve Road Draught, a beer named for the main arterial running by the brewery, complete with an outline of the building housing it on the can. 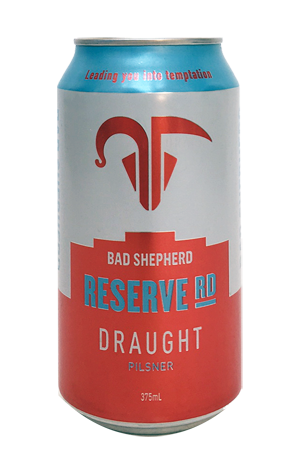 Yes, can: this is the first Bad Shepherd beer to get tinnie treatment too. If you'd like to know what sort of beer the Draught is, it's easy to find out as the craft brewer in co-owner Dereck Hales couldn't resist adding "Pilsner" to the title. Thus you can look forward to soft, spicy, nettle like hop aromas, maybe a touch of lemon too, gentle cracker and biscuit malts and a well judged bitterness. It may be aiming for a broader audience, but there's little common ground with industrial lagers here – other than the image of the industrial unit on the can.